In a large bowl, add in flesh of avocados. Discard pits and peel. Add in lime juice and smash avocados with a potato masher. Once mixture is nice and creamy, add in the onion, tomato and cilantro. In a separate area, crumble bacon or break into large pieces. Use as much or little as you would like. Add bacon pieces to guacamole and mix it in well. Add a dash of garlic powder and a sprinkle of black pepper to taste. Mix well for a final time. 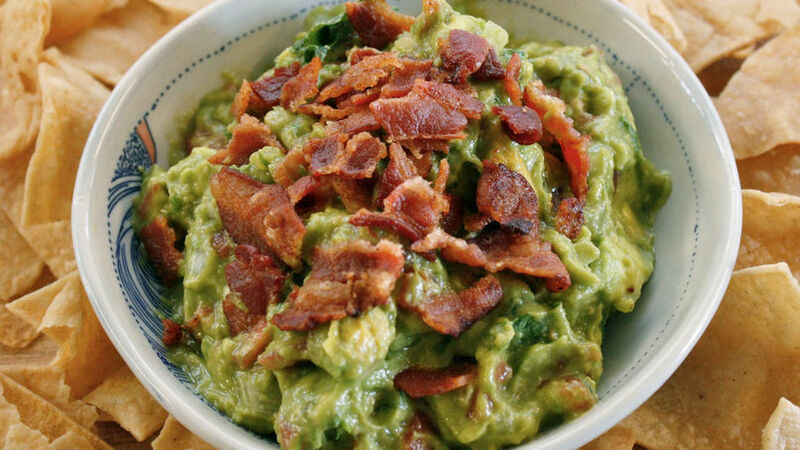 If you have extra bacon and want to use it, crumble more on top of guacamole. Enjoy! You don't have to use the entire pound of bacon in this recipe, if you are feeling frugal save a few pieces for another use. I was thinking of my viejo Mando when I was conjuring up this recipe. He’s a huge guacamole fan and I wanted to combine his love of the green stuff with another food love of his. It really wasn’t that hard. My choices consisted of guacamole with hash browns, guacamole and foie gras, guacamole and mussels, or guacamole and bacon. Needless to say I went with the latter. The salt in the bacon adds that little extra kick that sent my man over the moon when I showed him what I had made for him. He was in heaven and was almost getting upset with me as I dipped a chip into the guacamole to share with him as we watched the ballgame together. I guess the little glutton wanted it all to himself! He said it tasted like a BLT minus the lettuce. He was calling it a BAT: Bacon, Avocado, Tomato. Naturally, Mando asks me for this pretty frequently these days. Try it for your loved one and see what they think or better yet, just make it for yourself!